Muammar Qaddafi (Arabic: مُعَمَّر ٱلْقَذَّافِيّ) (born 7 June 1942 - died 20 October 2011), known as The Daffy Duck to his friends, was the longest-serving Great President Forever of Libya. 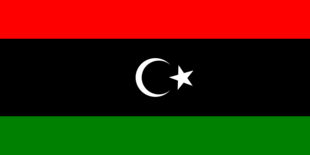 Despite being only sixty-nine-years young he claimed to have been the acting President of Libya for the last seventy, having taken the presidency by force simply walking in and taking it in an effortless 1969 coup. 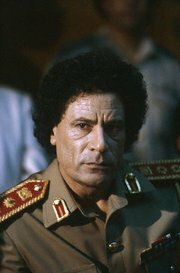 5.1 People whose names rhyme with "Gaddafi"
Having failed to spread his revolution by invasion, Gaddafi adopted a more Western political philosophy and began to murder his own people and blaming others for it. Gaddafi had always said that the one he grudgingly admired about America was its ability to make dissenters vanish properly, and not having their bodies turn up in a hotel room somewhere in Eastern Europe with a shoddy two-tap in the base of the brain and some used kebab wrappings nearby. Understandably, his antics have attracted popular musicians and artists such as Wham!, Barry Manilow, and Boy George, who regularly visit Libya and perform at Gaddafi's Nuremburg-like military parades. In early 2011, Al-Qaeda thought it would be a good idea to send some troublemakers to "rebel" a bit and give people psychoactive, brainwashing drugs. According to Muammar Qaddafi, these efforts were supported by the United States, N.A.T.O., the U.N., Israel, and The Red Cross. The amount of drugs given to normal, Gaddafi-loving people was enormous, as half the country fell to drug-crazed protesters overnight. Anti-Gaddafi protesters, high on drugs and led by Al-Qaeda, eventually broke into armories and declared "AYY KAY FORTEE SEFFEN FOR EFFERYBUDDY!!!" 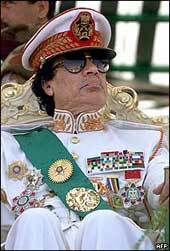 in typical Muslim fashion, at which point Gaddafi met his supporters and dictated that they take arms. 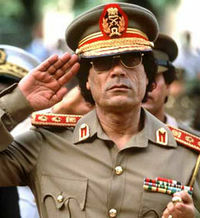 Colonel Muammar Qaddafi, saluting a camera. 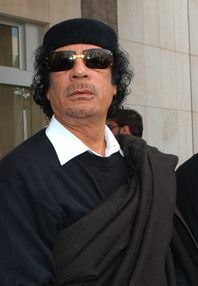 Muammar Qaddafi never married because he made gay marriage illegal in Libya in 1972. He stated on his Facebook that his favorite alcoholic beverage was "never enough", and his favorite television show was The Tyra Banks Show. This page was last edited on 26 January 2018, at 03:07.